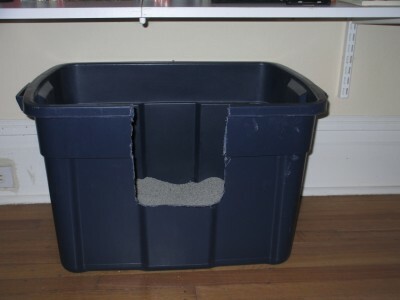 The qualities of a perfect litterbox could fill another blog entry – let’s just say, size, style, location, litter and cleanliness are all important players. 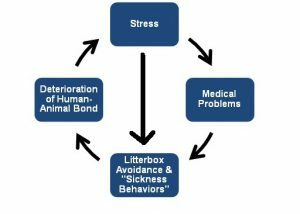 Today, I’d like to focus on the interplay between stress and health, and how stress can even impact your cat’s attitude toward the litterbox! If your cat starts avoiding the litterbox (even just sometimes), take him or her to the vet to rule out a medical issue. While many vets check for a urinary tract infection (UTI), UTIs are not common in young cats, but are more likely in cats over the age of 10 [1, 2]. 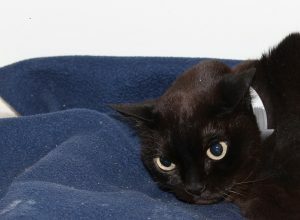 The leading cause of urination outside the litterbox is Feline Insterstitial Cystitis (FIC), a chronic pain syndrome affecting cats of any age. Stress, a sedentary lifestyle and an exclusively dry food diet are all linked to FIC . Unfortunately, FIC is a diagnosis of exclusion, meaning other causes have been ruled out, but lab tests may be inconclusive. Two recent studies comparing healthy cats and cats who had been diagnosed with FIC showed both groups of cats were likely to show a similar increase in “sickness behaviors” (such as elimination outside the box, decreased appetite, and vomiting) when exposed to stressors, such as an inconsistent schedule and handling by strangers. Cats with FIC were less likely to eat and more likely to delay elimination. 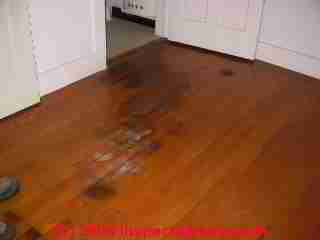 The effects are particular strong when cats are living in an impoverished environment. Many owners don't recognize common signs of stress in their cats. Photo by Dilara Goksel Parry. So why are cats so easily stressed? And why does stress make them avoid the litterbox? Cats have a much more sensitive sensory system than ours. They may perceive threats we don’t notice, such as pheromones from stressed animals or noises out of our range of hearing. While cats are hunters and predators, they are also prey animals, sensitive to dangers in the environment. Cats with FIC may be even more sensitive to these stressors [3, 4]. To further complicate things, many cat owners aren't aware of the types of things that might stress out their cats (such as letting strange cats come into the house) or of the common signs of stress in cats. 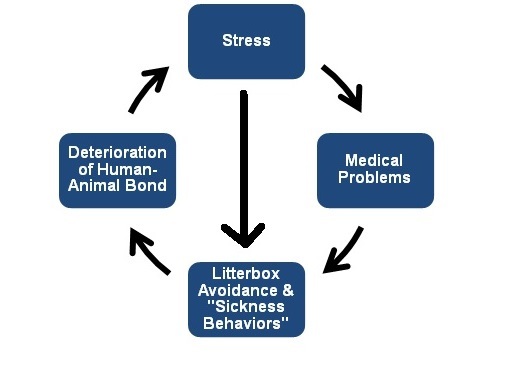 The connection between stress and litterbox avoidance may be direct – stress may cause FIC, which causes discomfort when eliminating. That pain may be associated with the litterbox, which may lead to avoidance of the box and urination in other places. Maintain routine: studies have shown that routine helps reduce stress in cats. This means, as much as possible, provide a routine for your cat. Feeding schedule, playtime, grooming should all be done around the same time each day. Increase exercise and mental stimulation: Cats need things to do and they need to move their bodies! Interactive play is a great way to bond with your cat and reduce stress levels (just like exercise can reduce our stress!). 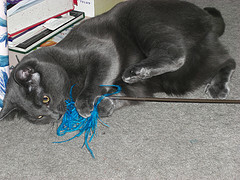 For supervised play, feather wands, Neko Flies, and Da Bird are all great options to start with. Offer safe solo toys, such as ping pong balls, to your cat as well. Food puzzles can provide your cat with mental stimulation by making her work for her food. Keep the environment low-stress: Your kitty may need a safe space, such as a cat tree, to retreat to. Loud outside noises can be buffered with white noise, such as a fan. Seek professional help if your cat needs help coping with stressors in your environment (such as difficulty adjusting to a new family member). Make the litterbox(es) the best it can be: Most cats prefer a large, open litterbox with unscented, sandy litter. Multiple litterboxes are ideal, and look for a compromise between accessibility and privacy – don’t place the box somewhere your cat doesn’t want to go (the garage or cellar can be difficult for some cats to access). Most importantly, KEEP THE LITTERBOX CLEAN! Don’t punish your cat for litterbox lapses. Punishment won’t fix the problem, and may make a behavior problem worse: punishment will increase your cat’s stress level. Be sure to clean up with a good enzyme cleaner and seek help from your veterinarian and a qualified cat behavior expert! 1. Lappin, M. R., Feline internal medicine secrets. 2001: Elsevier Health Sciences. 2. Hostutler, R. A., Chew, D. J. & DiBartola, S. P. 2005 Recent concepts in feline lower urinary tract disease. Veterinary Clinics of North America-Small Animal Practice 35, 147-170. 3. Westropp, J. L., Kass, P. H. & Buffington, C. 2006 Evaluation of the effects of stress in cats with idiopathic cystitis. American journal of veterinary research 67, 731-736.